I have a little man in my life, his name is Xavier and it’s his birthday tomorrow. He’s very special to our family for lots of reason, one of which is he was born 3 months after my first child, my son Billy. 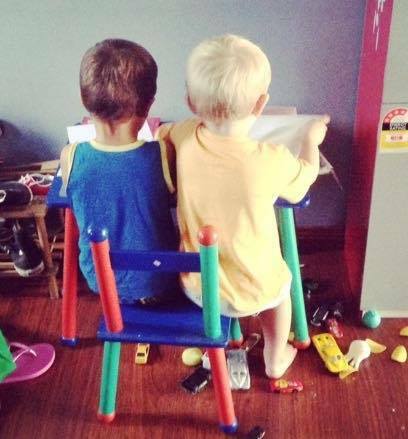 Billy and Xavier (pictured together, above) had a connection from birth, and even though they are two very different little boys, they are the very best of friends. Recently Xavier was a bit sad because he felt like he wasn’t good at anything, unlike Billy. Billy who can run faster than any five year old I know, Billy who isn’t scared of climbing or jumping off things, Billy with his brown skin, Billy who can tie his own shoelaces, Billy who knows how to play chess. I know what it’s like to feel your own downfalls are amplified by someone else’s strengths. Don’t get me wrong, I see absolutely nothing wrong with Xavier, but from his perspective, compared to Billy’s athletic skills and agility, I can see why Xavier might sometimes feel like a pale, clumsy giant. But why is it then, that when Billy and Xavier play together, it’s always Xavier who calls the shots? Why is Billy always happy to be Robin so Xavier can be Batman? Why is Billy happy to be Bob Irwin so Xavier can be Steve? Why is Billy always Bumblebee so Xavier can be Optimus Prime? One time after the boys had watched The Jungle Book, Billy was Mowgli and Xavier was Baloo, but only because Xavier insisted that Billy had to play Mowgli because he had brown skin. The truth is that Billy will be whoever Xavier decides. Xavier is the one with the ideas and Billy is always happy to run with them. This is who our kids are. And as our beautiful boys grow up to value more than who is best at riding their bike and who can run the furthest without getting puffed, I know that my nephew will find his time and place to shine. You are doing great things and will do greater things for sure. This is so sweet! It’s nice that they are so close in age so they can grow up together! Such a beautiful post; filled with love!